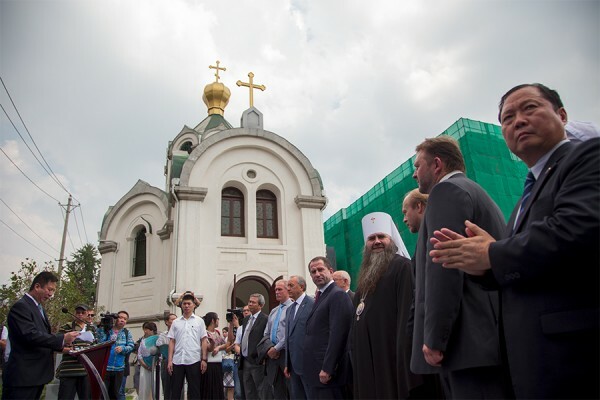 On 6 August 2015, the House of Russia-China Cultural Exchange opened at the restored building of the Church of St Alexander Nevsky in the city of Wuhan, China’s Hubei Province. Among those who took part in the opening ceremony were Metropolitan Georgy of Nizhny Novgorod and Arzamas; Mr. Mikhail Babich, Plenipotentiary Envoy of the President of the Russian Federation to the Volga Federal District; and heads of several Volga regions. The Church of St Alexander Nevsky was built in 1893 thanks to the efforts by Pavel Dmitriyevsky, a Russian orientalist scholar who was later appointed General Counsel in Shanghai. The Russian tea merchants who were trading in Wuhan at the time also made their contribution to the construction of the church. In the mid 20th century, some two thousand Orthodox Chinese faithful from nearby villages would attend the Church of St Alexander Nevsky. Chinese children studied at a school established at the church. In the time of the Cultural Revolution the church was confiscated from the faithful and was used first as a warehouse and later as a marriage registration office. By reason of the construction of a tunnel under the Yangtze River, it was planned to demolish a number of buildings. The church could also be destroyed. However, on the initiative of His Holiness Patriarch Kirill of Moscow and All Russia and following his visit to China in 2013, an agreement was reached between Mr. Mikhail Babich, Plenipotentiary Envoy of the President of the Russian Federation to the Volga Federal District, and Mr. Yang Jiechi, a member of the State Council of the People’s Republic of China. The agreement implied the conservation and restoration of the Orthodox Church of St Alexander Nevsky in the city of Wuhan through the efforts of both sides. Mr. Babich appealed to Metropolitan Georgy of Nizhny Novgorod and Arzamas for assistance, and in December 2013 a group of specialists was sent to China from the metropolia of Nizhny Novgorod. In September 2014, the Chinese specialists visited Russia to hold necessary consultations.